We are now accepting registrations for up to 18 “big canoes” (aka Voyageur Canoes). Register for the Brigade at http://voyageurbrigade.org/future-brigades/athabasca-river-voyageur-canoe-brigade-2017/ The registration deadline for the full Brigade is April 30th, 2017, so register early to ensure you are one of the 18 big boats we can accommodate. Our Brigade will be made up of crews consisting of 9-12 paddlers paddling “big canoes” 22 to 36 foot long replicating canoes used by Voyageurs in the original fur trade. On the water it is recommended that there be up to 8 crew members in a 25 foot canoe with the non-paddling members for each shift looking after camp and travel chores. Individual crews are responsible for paddling schedules to ensure paddling and support chores are equally shared by all crew members. With a full crew of 12 paddlers, members paddle approximately a ½ day shift for each day. There will be a mid day crew change opportunity on 5 of the 6 days of paddling. Some crew members will occasionally paddle an entire day depending on scheduling. Brigade organizers will initially be responsible for setting the paddling schedule, booking and paying for campsites and coordinating events with the local communities and facility operators. Registration packages for crews and individual paddlers will be the sole responsibility of the Brigade organizers. The Brigade organizers will assist individual paddlers in finding crews to paddle with and have contacts for teams that don’t have their own voyageur canoe. The organizers will also be responsible for safety planning and require daily pre-trip safety briefings with crew leaders who shall then communicate expectations to their paddling crew. An “all crew” welcome and briefing will occur on Day 0 (June 22nd) at 8 p.m. The arrival and celebration at Ft. Assiniboine on the last day will involve Alberta’s Lieutenant Governor, Lois Mitchell. Those wanting to participate in the Fort Edmonton Brigade on the North Saskatchewan River, following this brigade, will have June 29th to travel to Devon to do so. View our full itinerary: 2017-Athabasca-River-Brigade-Paddling-Schedule-with-Events-April-25-FINAL. Each voyageur canoe crew will have a designated crew leader who coordinates and works with their individual crew members. The crew leader will be responsible for assembling and registering their crew with Brigade organizers. Participants must be diligent in submitting the required paperwork such as CVBS membership, waiver forms and fees through their crew leader for submission to the Brigade Registrar. All transportation, paddling equipment and camp gear will be the sole responsibility of each crew. There are requests from communities visited for the Brigade to present and display the skills and character of Brigade paddling and crew members are expected to take part in these celebrations and interact with the public. Teams are encouraged to have brigading outfits for these events or at a minimum, sashes or bandanas similar to the original Voyageurs in the late 1700’s and early 1800’s. After finding a crew to join or organizing a crew for the 2017 Athabasca River Brigade, participants are expected to help out with all individual crew activities involved in brigading, such as initial preparations for the Brigade, ensuring they get equal opportunities to paddle in the Brigade, providing support to the crew and Brigade when not paddling and participating in community events en route. Individual participants are responsible for their own personal gear throughout the Brigade. Upon departure, everyone involved in the Brigade will ensure that all campsites are left in better condition than found upon arrival. Each crew is responsible for their own transportation, and it is highly recommended that each crew try to minimize the number of vehicles involved with the Brigade. The more vehicles each team has, the more complicated their ground transportation logistics become. The Brigade will be providing busses in the first four days on certain paddling sections due to some logistical and safety complications In Jasper National Park, Obed Mine site, and on West Fraser’s Emerson Creek Road. The cost per crew is $2400 which works out to a cost of $200/person if you are a team of 12 paddlers. This cost covers all camping, participant insurance and bus transportation for certain put in and takeouts in the first four days of paddling, community and brigade participant entertainment and celebrations, 4 meals (2 lunches, 2 suppers) and SWAG. Additional costs to expect are crew/camping gear transportation down-river, other meals, possibly canoe rental costs, depending on each team’s circumstances, and personal costs to and from the Brigade. Paddlers unfamiliar with the basics of brigading can use the 2011 David Thompson Columbia Brigade Paddlers Manual as prepared by Ted Bentley as a guideline. A link for this can be found on www.voyageurbrigade.org. Since we are anticipating several teams with limited big boat paddling experience, Brigade organizers with extensive experience paddling in past Brigades are prepared to hold a two day instructional big boat canoe course on May 27-28 at Shining Bank Lake. There will be a $30/person charge (payable on arrival) to cover instructional, travel and canoe rental expenses in this unaffiliated course. This course is informal and no certification will be provided. Individuals interested in taking part are to contact Rick Zroback at. rickzro@gmail.com 780-865-7681 by April 16, 2017. Further details and scheduling will be provided only to those who have contacted Rick to indicate interest. YOUNG PADDLERS POLICY: Paddlers under the age of 14 must have received explicit written permission of the Registrar and Event Chair. Permission to participate will be based on evaluation of their previous paddling experience; and it is expected that a parent/guardian will be present in the boat with paddlers under the age of 12, and travelling with the brigade for paddlers between 12 and 14 years of age. To request review of a young paddler and obtain permission to participate in the Brigade, please contact the Registrar, Carrie-Anne Guthrie, at caguthrie42@gmail.com. REGISTER NOW!! Interested in paddling? Registrations are being accepted via Zone4.ca. Search Athabasca River Brigade or read on and follow the direct link to the appropriate form. If you have a boat and some, all, or none of a crew of paddlers, please complete the “Preliminary Canoe/Crew Registration” form on www.zone4.ca and pay your deposit via credit card ($2 +3% of deposit processing fees will be applied at the time of transaction completion). Please note that, upon receiving confirmation from the registrar that your boat has been accepted into the Brigade (ie. there’s a spot reserved for your boat), the Crew Leader will instruct each crew member on obtaining a CVBS membership for insurance purposes and providing their membership number to their crew leader, who will provide same to the Brigade Registrar at the time of Final Registration along with remainder of payment. You will be asked to indicate on the form any need for additional paddlers, and a list of available “unattached paddlers” will be sent to you for you to review, contact and select the remainder of your crew prior to final registration. If you are a paddler without a boat, we want you! We expect to have several boats with partial crews who will gladly fill their boats with folks like you. We also have a couple of boats that will be crewed solely by “unattached paddlers” who don’t get onto other crews, and if you’re an entire crew without a boat, please designate a Crew Leader and Boat Name, as we hope to be able to accommodate you as well! Please complete the Unattached Paddler” form on www.zone4.ca. There are no fees associated with this form, however, once you become a member of a crew, you will be responsible for obtaining a CVBS Membership (good for a year’s worth of paddling anywhere in Canada), paying the crew leader all required fees, and providing your membership number to your crew leader, who will provide same to the Brigade Registrar upon completing the Final Registration. CVBS Membership: All paddlers must obtain a Canadian Voyageur Brigades Society (CVBS) Membership and provide their Receipt Number/Cart Number to their Crew Leader prior to completion of Final Registration. This membership will be for the duration of one year, and will insure you for any paddling within Canada. Please visit the Zone4 form “CVBS Membership 2017” to complete this registration only after your Crew Leader has received confirmation that your boat has a berth in this brigade. BRIGADE REGISTRAR AND CANOE AVAILABILITY: Carrie-Anne Guthrie at caguthrie42@gmail.com 780-865-5744. 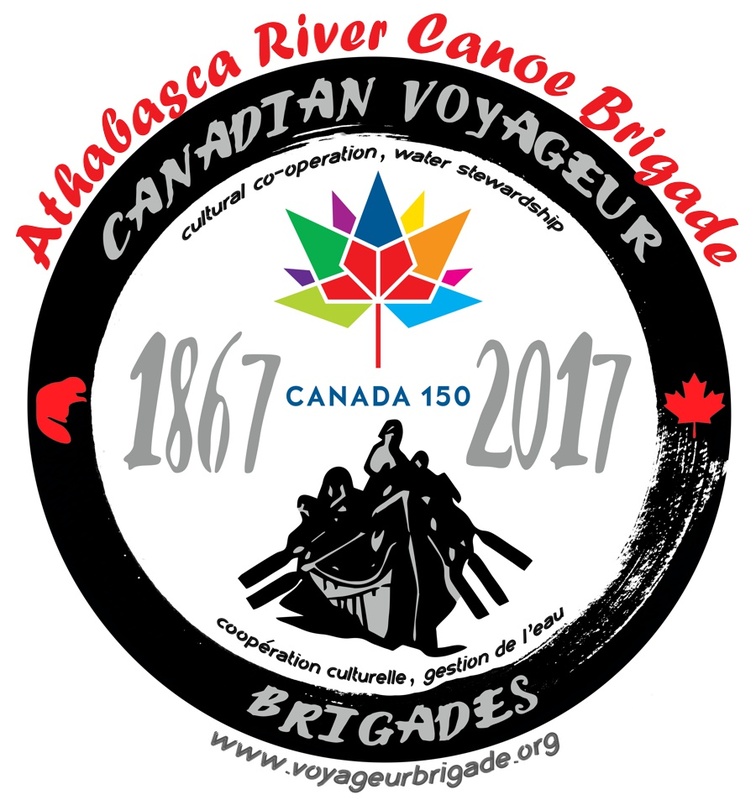 The 2017 Athabasca River Brigade, occurring in Alberta is part of 2017 Canadian Voyageur Brigades.